This product is one that is so simple that I am baffled that no-body has thought about launching something like this sooner. 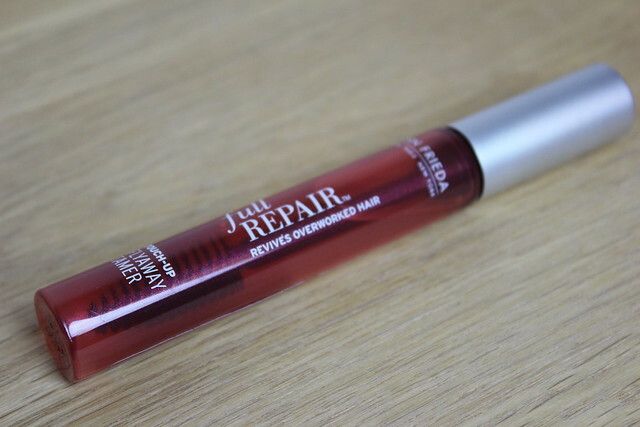 Yet they haven’t and as someone with permanent fly aways and generally ‘fluffy’ edges to my hair, I am thankful that the clever bods over at John Frieda have done so – it’s one of those things I never knew I needed, but after trying I now wonder how I lived without it. Basically it’s just a large mascara wand in a tube of light serum – that you remove from the tube and apply to tame any frizziness around the hair-line, or maybe your parting – where ever you feel you could do with a little smoothing down. For me, it’s the perfect way to tame the little bit of fluff I constantly have around my hairline/parting. Yes, it really is that simple! Which basically means I don’t have a whole lot more to say about it – other than that it’s a great little hand-bag item to keep your hair looking smooth and polished all day. I find this smooths without weighing down hair at all. The mascara wand is the real trick though, it just makes it really easy to use without overloading hair – easily done if you have fine hair like me! I believe that Ojon have something similar on the market if you’re perhaps looking for something high-end – but for me, this is ideal. It’s small, works and doesn’t break the bank. This is a really good idea. I often have problems with new hair growth on the top of my head down my parting just sticking straight up in the air but I can never seem to be bothered to try and tame them. I really like the sound of having something small tucked in your bag that you can pull out and use to comb those pesky hairs down!